Linnik Anna has been working at the Department of applied mathematics since 2000. She graduated of the mechanical-mathematical faculty of the Kharkov State University on a speciality “Applied mathematics”. In 2002 she was conferred a degree of candidate of technical Sciences. Linnik Anna actively engaged in the preparation of students for participation in Ukrainian mathematical Olympiads. 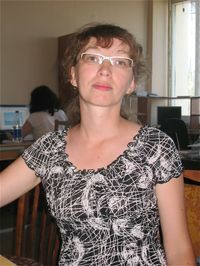 She is co-author of many manuals, published by the Department. Specialist in the field of the theory of R-functions, mathematical modeling and computational methods. She has over 25 scientific publications.